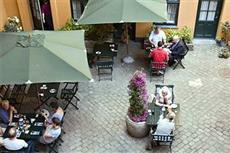 The Danmark Hotel Copenhagen is located right in the heart of the city. Guests will have convenient access to attractions such as Stroget, Tivoli Gardens and the Glyptothek Art Museum. The Copenhagen waterfront is located less than a block away. Numerous restaurants, cafes and pubs are located in the nearby area. There are also many shopping venues located within the area near the hotel. Entertainment venues are not far away from the hotel. The Danmark Hotel Copenhagen offers a car park for the use of guests who arrive by car. The airport is located within a 10 kilometer drive of the hotel. Public transportation services, including bus and metro lines, make it easy to access the hotel and get around the city. There are 88 well appointed guestrooms at the Danmark Hotel Copenhagen, each offering a television, radio, telephone, hair dryer and Internet access. Amenities available at the Danmark Hotel Copenhagen include an on site restaurant, garden bar, babysitting services and conference room. The hotel is completely carbon neutral.